This word is frequently used among Japanese CW enthu. This word originally comes from a Chinese proverb 以心伝心. In Japanese it pronouce "I Shin Den Shin". It mean that to communicate heart (or mind) with each other by means of their heart ( or mind). In other words, to communicate with each other's mind without speaking any word. The first two characters以心"I Shin" means "by means of heart (mind)"
The last two characters伝心"Den Shin" means "to communicate heart (or mind)". In same pronounceation, "Den Shin", there is another word that is 電信. 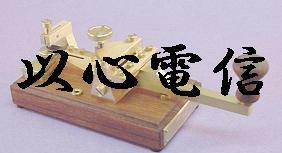 This 電信"Den Shin" means "Telegraph". Yes, as you know, "Telegraph" can communicate with each other without spaeking any word. Moreover, in case of frequently worked station, sometimes you can recognize not only his call sign but also personal condition, etc. when you just hear his keying!. Therefore, is frequently used to express CW's fantastic potential.